The jumbo special police badge is a great novelty costume accessory for a Keystone cop or a silly over the top police officer costume for Halloween or a funny skit. Because of its size this police badge will definitely be noticed. 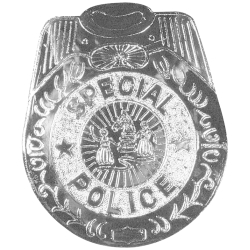 The jumbo special police badge is made of silver toned plastic with an attached pin and measures 6” tall by 2.5” wide.